Police said a handgun was found in West's pocket, another in his pant leg and a shotgun in a guitar case strapped to his back. A shotgun in a guitar case strapped to his back? That is f*cking awesome. Was he going to duel Uma Thurman from Kill Bill or something? I didn't even know he played the guitar. In baseball news, the Sox beat the O's. Not much has changed all season in that department. Why am I up so early on a Saturday morning? 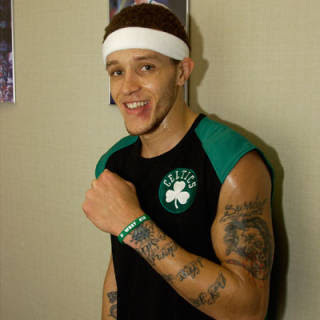 Oh yes, the Delonte West nightmares. Now I remember. hahaha. awesome. I suppose he's got to defend himself against Shaq and LeBron. or the Terminator.